Gigantic Breeze and Gamble’s Ghost will set out to defend their titles in this year’s editions of the Grade 2 Autumn and Grade 3 Maple Leaf Stakes co-featured on Saturday’s 11-race program, which will have a special post time of 12:20 p.m. Trained by Alex ‘Sandy’ McPherson for Hopefield Farm, Gigantic Breeze will face eight other formidable foes in the $175,000 Autumn Stakes to be run over 1-1/16 miles. 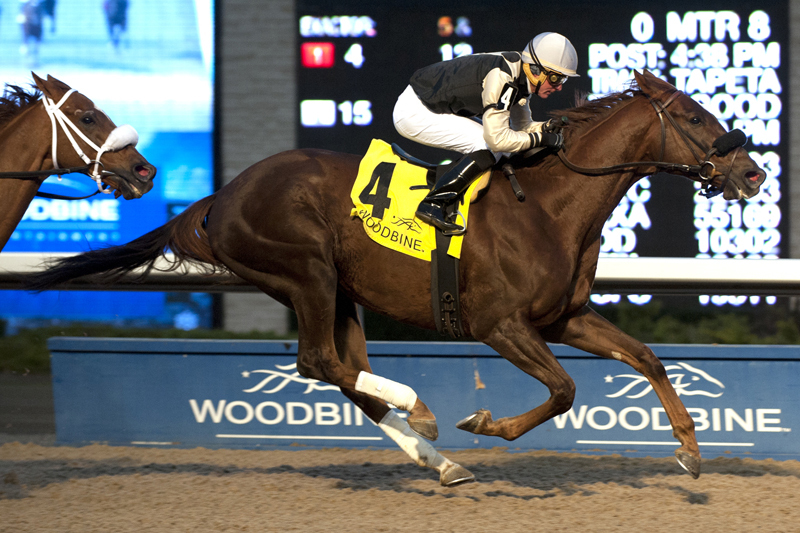 The five-year-old Giant’s Causeway gelding has been a top contender in his first three graded stakes assignments this year at Woodbine, including a second-place effort in the Grade 3 Seagram Cup on August 12. From there, he shipped stateside and rallied from the back of an 11-horse field to finish fifth in the mid-September Presque Isle Mile, a race he won last year before taking the Autumn Stakes. With his former jockey Gary Boulanger opting to ride the Norm McKnight-trained Decorated Solider, who won the Seagram Cup and Presque Isle Mile, Kazushi Kimura will pick up the mount on Gigantic Breeze. McPherson also tipped his hat to Grade 1 Ricoh Woodbine Mile runner-up Mr Havercamp, the 7-5 morning line favourite from the Catherine Day Phillips stable, and the accomplished Roger Attfield trainees Shakhimat and millionaire Are You Kidding Me, who won back-to-back Autumn Stakes editions in 2015-16. The field also includes Florida Won and Giant Storm, both also conditioned by McKnight, as well as a pair of Mark Casse trainees fresh off graded stakes wins at Woodbine, Lookin for Eight and Lookin to Strike. Gamble’s Ghost headlines a field of 11 fillies and mares as the 5-2 morning line favourite in Saturday’s co-featured $125,000 Maple Leaf Stakes. The five-year-old Ghostzapper mare heads into the 1-1/4 mile event riding a three-race win streak that includes victories in the Grade 3 Trillium, Grade 3 Ontario Matron and Belle Mahone for trainer Josie Carroll and owner/breeder Ivan Dalos. She will have top jockey Eurico Rosa Da Silva aboard as she tries to repeat in the Maple Leaf from the outside post and add to Dalos’ meeting-leading stakes win total of seven.